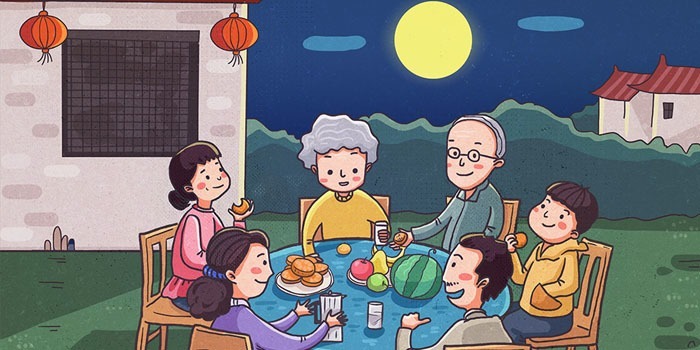 Mooncakes (月饼 yuèbǐng /ywair-bing/) are traditional snacks/desserts of Mid-Autumn Festival, the second most important festival in China. It is said that there is a moon goddess who makes these cakes, so people call them mooncakes. 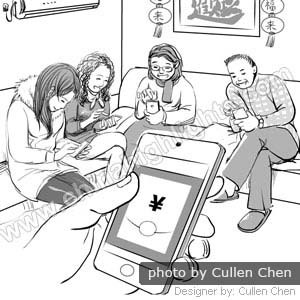 People often give mooncakes as gifts when visiting friends and family around Mid-Autumn. There are many flavors of mooncakes on the market. So how do you choose? Here we introduce the top 10 flavors of mooncakes that you should consider trying to help you choose. The first four flavors are very common, but the last three flavors are quite new, and only a few shops are selling them. 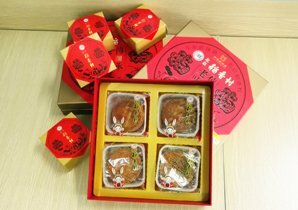 Five kernel and roast pork (五仁叉烧 wuren chashao /woo-ren chaa-shaou/) mooncakes are the most traditional classic flavor. Compared to other common flavors, five kernel and roast pork mooncakes are much more expensive. They are filled with mixed nuts and seeds (almonds, walnuts, and dried winter melon, sesame, and pumpkin seeds) and roast pork. You will get a different taste with each bite. Most Chinese, especially seniors, love this flavor. Red bean paste (红豆沙 hongdousha /hong-doh-shaa/) mooncakes are filled with a rich, thick, red bean paste, and taste sweet and smooth. The red bean paste gives a lingering flavor, and the scent fills your mouth after each bite. Some people don’t like such a sweet taste, but a cup of tea is a good choice to go with them. Lotus seed paste (莲蓉 lianrong /lyen-rong/) mooncakes are a famous Mid-Autumn Festival dessert of Cantonese origin, which have become popular all over China and even overseas. Lotus seed paste is considered the most luxurious mooncake filling. Due to the high price of lotus paste, white kidney bean paste is sometimes used as filler, sometimes with duck eggs, so make sure you don&apos;t go too cheap and get a real lotus paste mooncake. Snow skin (雪皮 xuepi /shwair-pee/) mooncakes are non-baked mooncakes, which originated in Hong Kong, and have become fashionable in China. The crust is made of frozen glutinous rice, and looks snow white. Now some people add juice to the crust to make it look more colorful. The fillings can be sweet or savory, or both, such as fruit and duck egg yolks. It tastes more wonderful chilled. 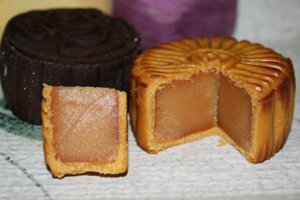 Fruit and vegetable (果蔬 guoshu /gwor-shoo/) mooncakes are filled with fresh vegetables and fruits, and taste soft and smooth. Fillings including honeydew, litchi, and pineapple make this traditional dessert healthier. Chocolate (巧克力 qiaokeli /chyaou-ker-lee/) mooncakes make Mid-Autumn Festival more romantic. 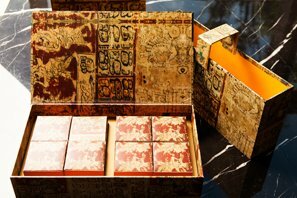 The attractive mooncake appearance and the thick scent of chocolate mix traditional Chinese culture and Western romantic culture together. The crust is made from chocolate and the filling can be oats, berries, Oreo flavor, etc. 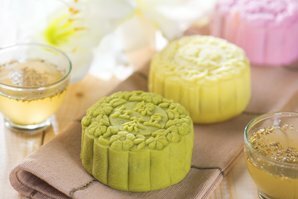 Both tea and mooncakes are among the most traditional of Chinese foods, and together they create a new mooncake variety: green tea (绿茶 lvcha /lyoo-chaa/) mooncakes. They are mainly filled with tea leaves and other ingredients, like lotus paste. With the taste of fresh tea leaves, the usually greasy taste of mooncake is well balanced. Ice cream (冰淇淋 bingqilin /bing-chee-lin/) mooncake is a new look for traditional Chinese mooncakes. Cooling instead of warming, the refreshing taste makes it popular among young people. The crust is often made from chocolate and the fillings can be any flavor of ice cream you like. The main feature of cream cheese (奶油皮 naiyoupi /nigh-yo-pee/) mooncakes is the golden and crispy crust with a thick milky flavor. It is not as sweet as other mooncakes. There are many fillings, mostly pastes and jams, to meet different customers&apos; tastes. Seafood (海味 haiwei /high-way/) mooncakes are more expensive than other types of traditional mooncakes. 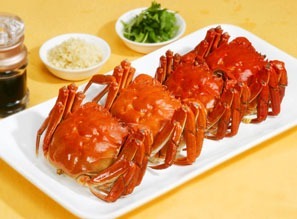 As their name suggests, they are filled with seafood like abalone and seaweed. They taste fresh and salty. If you don’t like sweet mooncakes, and like seafood, seafood mooncake is a good idea. 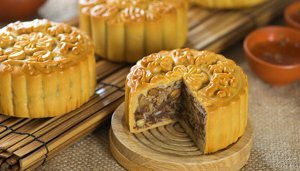 The most popular mooncake brands in China include Daohuaxiang (稻花香), Anqi (安琪), Tianlun (天伦), Huamei (华美), Ronghua (荣华), CANSO (元祖), Maxim&apos;s (美心), Miqi (米旗), Xinghualou (杏花楼), and Maiquer (麦趣尔).